In the previous post, we looked at what was involved in getting the shock surprise intro scene for Meetup Pop up and running. In the process, we saw a bunch of the CocosSharp classes in use, including sprites, nodes, actions and transitions. In this post, we'll deal with the final screen of Meetup Pop, the actual game screen. Before we get into the code again, it's worth spending a bit of time discussing in more detail the flow of the game. It's very simple, but there are a few subtleties that might not immediately be obvious. after each wave, the speed of the balloons is increased by 2.5% compounding. This doesn't sound like a lot, but it quickly increases the difficulty significantly! the background of the game changes based on how well the player is currently doing - brilliant green when lives are highest, dark and rainy when near game over. Pretty basic. The cool thing about this ruleset is that we can implement its logic without having to manage the game loop frame-by-frame. CocosSharp certainly supports this method of logic programming (via the CCNode.Schedule method), but in our case, we can get by with smart use of CCActions. Handle game over and resetting the game. 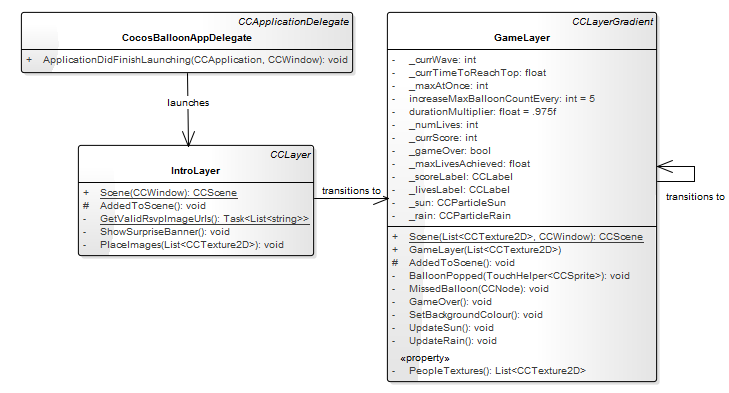 Looking again at the GameLayer class, you can see the variables that keep track of the game logic, and a few methods for handling events that occur - BalloonPopped, MissedBalloon, GameOver. The new class in this snippet is the particle effect - CCParticleRain. Out of the box, CocosSharp comes with a number of particle effect generators, and you can define your own quite easily using a tool like Particle Designer. CCParticleRain is a builtin that will do just fine (and there are plenty more - CCParticleExplosion, CCParticleSun, CCParticleFlower, CCParticleFire and CCParticleGalaxy just to name a few). The rain effect is used to change the background of the screen when things are getting particularly dire - the worse the player's situation, the heavier the rain. Initially, the rain effect h6as a scale of 0 so that it is not visible. We also add labels for score and lives, nothing you haven't seen already. Finally, the SetBackgroundColour method is called for the first time. This method runs after every balloon is popped or missed and adjusts the background of the game to reflect the state of the player - bright green when things are going well, dark red when the player's life count is low. In combination with the rain, the effect adds a bit of character to an otherwise basic game. Notice how the screen initially gets brighter, then progressively darker. The core logic for the game lives in a continuous while loop, that launches waves of balloons until the game over sequence has finished. When game over occurs, one final massive wave of balloons is launched for effect, so the loop has a little extra logic to handle that, most of which I have omitted, but it is fairly straightforward. First, the number of balloons to fire is determined. This is a random number between 1 and the current maximum number of balloons that can be launched based on the wave number (r is a local instance of System.Random). Note that if _gameOver is true, a lot of balloons are going to be generated. Once the count is determined, the balloons are generated with a random texture each time, such that we should get a wave of varying meetup participants each time. A TouchHelper class is attached to the balloon that calls BalloonPopped when the balloon is touched, provided _gameOver is not true. TouchHelper is a class I wrote to help handle hit detection for CCNode instances. It's available in the meetup-pop repository but has the caveat that it does not account for scaling or other transforms you might apply to your CCNode. In this case, we don't do any of that so it is fine. We will go over the BalloonPopped method later in the article. The first part of this code snippet ensures that balloon launches are staggered. Each balloon is then assigned a random point along the width of the screen, excluding the first and last 10% (because it can be hard to touch objects at the extremes of the screen). The PlaceAt helper is then used to place the balloon on the screen, at 110% of the height (because of the CocosSharp co-ordinate system, that is 10% below the bottom of the screen). The point to which the balloon will fly and the time to reach the top is calculated, with some variability added. We use a CCMoveTo action, which takes a duration parameter and target point, and interpolates the travel between points. However, before we run the move action, we wrap it in a CCSequence which first executes the move action, then executes a CCCallFuncN action - an action that runs code - in this case the MissedBalloon method, which takes a life away from the player. As you'll see in the next section, we rely on the fact that the BalloonPopped method cancels the actions running on the balloon that was popped, preventing a life from being taken away when the player pops the balloon, but allowing us to use the sequence to save us from writing code to check whether balloons moved off the screen. Finally, the wave characteristics are updated - increase the speed of the balloons by applying the duration multiplier, increase the wave number, and potentially increase the maximum number of balloons that can be launched for the next wave. In `BalloonPopped`, we add to the score and player's life count, update the labels and background colour, then animate away the popped balloon. In `MissedBalloon`, we do similiar things - take away a life, then update labels and background colour. However, we also need to check whether this missed balloon has taken lives to zero, and if so, call the `GameOver` method. Note that you can not pass the same instance of your scene into ReplaceScene - that doesn't make sense and will cause Bad Things to happen.